The difference between coaching, mentoring and counseling. Do you know what my team player skills leader said to me yesterday? He wants me to act as a mentor to one of my junior colleagues! But how do I go about it? I’m not even sure if I know what mentoring means. Mentoring, coaching and counseling are related concepts. All three deal with a process of helping another person to grow and develop. In a work environment a mentor, coach or counselor is usually a person who is experienced in the area in which the competencies of a colleague still need development. The diagram below illustrates the three concepts and how they differ in focus. Yes, but can you tell me what those same core skills are? To be able to maximize the growth of the individual being mentored and add value to the relationship, the mentoring skills and style of the mentor should be developed and adapted to suit the developmental level and need of the individual being mentored. Wait a minute, there’s still a lot I need to know! What does it mean to adapt your mentoring style to the developmental level of the individual being mentored? According to Hersey and Blanchard, four developmental levels of the individual being mentored can be distinguished, ranging from D1 to D4 (as they call it). At each level the individual being mentored needs a different monitoring style to maximize growth. They have further identified four mentoring styles (S1 to S4) which differ from each other in terms of the amount of supportive and directive behavior each encompasses. The diagram above illustrates what each developmental level entails, as well as the appropriate mentoring style that will facilitate the individual being mentored’s growth to the next level. OK, so that means that my colleague , who has high commitment and low competence, is on developmental level D1 and he needs a Directing Mentoring Style. S1: a lot of structure, control and supervision. 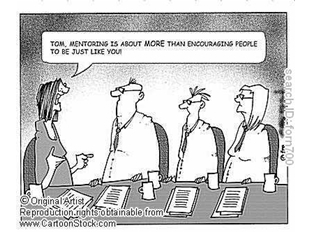 Remember to adapt your mentoring style as your individual being mentored moves to another development level. After achieving the goal, it is vital that the mentor assists the individual being mentored to REFLECT on the achievement. Through reflection (which implies honest feedback) self-analysis and self-evaluation, growth of the individual being mentored’s self-concept is facilitated. The Performance Management Process is a very effective vehicle for setting and reviewing goals.